Just a few notes on these photos. 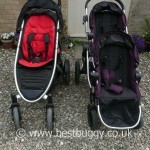 The Phil&Teds Verve and the Baby Jogger City Select are fairly similar in size. 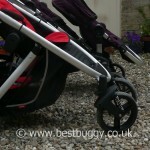 The Baby Jogger City Select is slightly longer at the front but the Verve handlebar and doubles kit protrude slightly at the back. The City Select offers a greater choice of seating positions and better ability to choose the positions of a newborn, toddler etc and to mix and match infant carrier / carrycot / seat. But the Verve in some respects is no fuss because you have no choice to make! 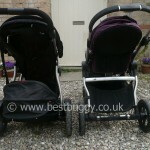 The City Select is easy to manoeuvre with a newborn and toddler or two baby twins, but as the children get heavier then it gets harder to push and to keep in a straight line. The Verve handles beautifully. 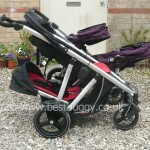 It pushes easily with a toddler and older baby in. 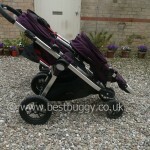 The Verve tackles all terrain easily without hesitation. 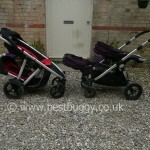 The front lifts up very easily to go up a kerb whereas the City Select is hard to get up a kerb. The Verve has almost no storage space when in doubles mode whereas the City Select has the huge basket which is great for shopping. The hoods on the City Select are fabulous. The Verve hoods are flimsy feeling and the main hood has a huge gap at the back. 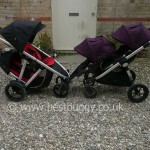 The City Select hoods can cope easily with a hot summer or a freezing winter. I have to say I would not want a child of mine so exposed in winter in the Verve. The City Select is simple to erect but it comes in pieces. 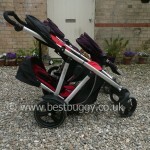 This makes it light and easy to carry between the house and car but some people find having various parts makes the City Select faffy. The Verve folds as one piece but it is very heavy to carry and lift. I an struggling to get it into my car boot. For me this comparison really comes down to three things. Handling, basket space and fold. 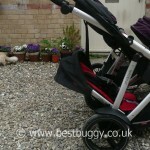 The Phil & Teds Verve handles much better; the Baby Jogger City Select basket is a dream for shoppers and which fold you prefer comes down to personal choice and your car boot space. 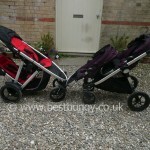 For more detail on both these pushchairs, do go and read the individual pushchair reviews on this website.